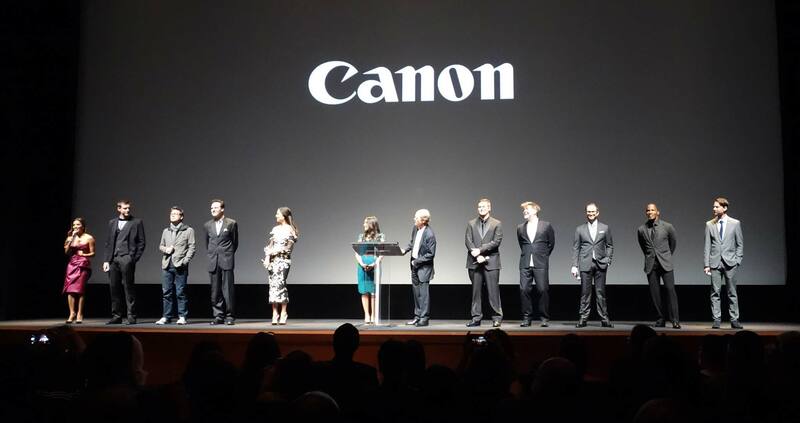 Canon U.S.A. hosted the premiere of their 2013 “Project Imaginat10n” Film Festival, at Lincoln Center yesterday. The project began with a contest for the public to submit still photos following 9 storytelling themes. 91 winning photos were selected. Each director chose nine photos, one from each theme, to guide their screenplays. A 10th photo was selected by Ron Howard: a difficult snail on a leaf. Each film was restricted to 9 minutes or less. Eva Longoria explained that she moved to Hollywood to become a stunt woman. Her fast-paced action-thriller “Out of the Blue” was her dream come true, with well-shot, tightly-edited action scenes, and nicely choreographed stunts. All 10 films and making-of’s can be seen online. Most of the shorts were done with Canon Cinema EOS Cameras. One film was shot in Super16 with Kodak 50D negative. Can you tell which one?